Just like you don’t have to be a tennis player to get tennis elbow, you don’t need to be an athlete to get athlete’s foot. 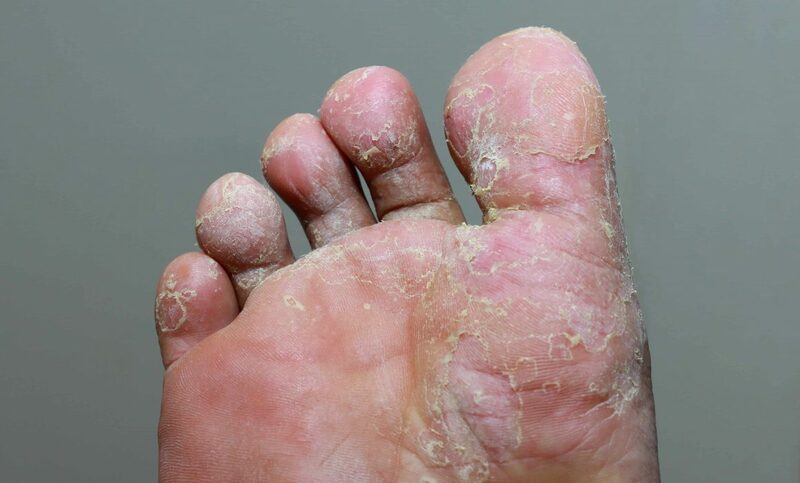 All you need is some warm, moist conditions.. like trapping your wet feet in socks and shoes to develop this annoying, uncomfortable, and contagious condition. Fortunately, there are ways to minimize your chances of getting athlete’s foot and treat it if you do. Athlete’s foot got its name because it was common among athletes who share locker rooms and showers. Those environments, and similar ones such as poolsides where people often walk around in bare feet on moist surfaces, are fertile grounds for the development and spread of the fungus which causes athlete’s foot. However, it’s not just exposure that causes this condition, it happens when those bugs are permitted to multiply in their favorite condition, your warm, moist foot in an incubator (socks and shoes). Athlete’s foot fungus belongs to a group of fungi called dermatophytes, which also cause jock itch and ringworm. These fungi love closed, warm, moist environments and feed on keratin, a protein found in hair, nails, and skin. If you walk on a wet surface that has been walked on by someone with athlete’s foot and then put your feet in shoes without properly cleaning and drying them, you can easily contract the fungus. So you could say that athlete’s foot is a contagious condition.